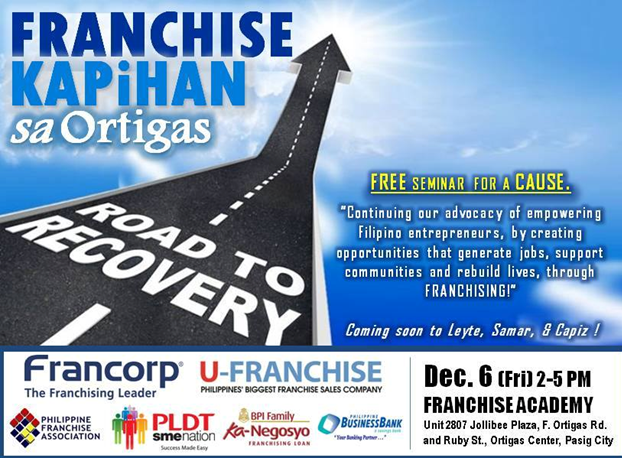 Francorp Philippines and U-Franchise’s free seminar ’Franchise Kapihan sa Ortigas’ continues their advocacy to empower local entrepreneurs, create more jobs and earning opportunities, support communities, and rebuild lives through franchising. There is no doubt that franchising is the new prevailing business model in the Philippines. Currently, there are more than 1,000 brands that are franchised across the country in five major sectors: retail clothing; fastfood; cafés, confectionaires, and bakeries; food carts; and hospitality and wellness. It is estimated that franchising now accounts for about 5% of total national GDP, providing jobs to more than a million Filipinos. This is why it is very timely for seasoned and budding entrepreneurs to further learn the ropes of franchising. Franchising consultancy firm Francorp Philippines and its marketing affiliate U-Franchise will facilitate a free seminar on December 6, from 2 p.m to 5 p.m. at Unit 2807 Jollibee Plaza, F. Ortigas Road and Ruby St., Ortigas Center, Pasig City. Dubbed as ‘Franchise Kapihan sa Ortigas,’ this event will facilitate interaction between franchisors and franchisees. The seminar also aims to help participating entrepreneurs from Yolanda-devastated provinces through giving new and effective business ideas so they could start taking the path towards recovery. This event will eventually be brought to Samar, Leyte, and Capiz for those entrepreneurs who can’t find the means to fly to Manila. You may also mark your calendar for other upcoming events from Francorp and U-Franchise. On January 15, 2014, Francorp will hold ‘Franchising Your Business,’ from 1–5 p.m. The seminar will further educate franchisors about the advantages and processes of franchising and the keys to franchisability. The event will also help participants in determining if their businesses are ready to be franchised to entrepreneurs. On January 18, from 2–5 p.m., U-Franchise will hold ‘Finding the Right Franchise That Fits U.’ It is aimed at teaching potential franchisees about the basics of investing in franchises. It will feature informative and helpful presentations to further educate participants. To register for any of Francorp’s events, email francorp.leads@gmail.com , text 0917.809.9043/0932.880.3280, or visit its Website www.francorp.com.ph . To register for U-Franchise’s event, email info@u-franchise.com.ph , text 0917.881.6999/0920.983.0247, or visit www.u-franchise.com.ph .